Charlie Dwyer, cofounder of Asia Pacific Superyachts and captain of a 42m sailing yacht, picks spots to chill out in the Gulf of Thailand. 1. Ang Thong National Marine Park This pristine archipelago of 42 tiny limestone islands off Koh Samui was the inspiration behind the film The Beach and is one of the best movie locations to visit on a luxury yacht. Start by exploring the caves and hidden lagoons by kayak before climbing a series of steep ladders to reach the seawater lake on Mae Koh island. Here you can view the shifting colours of the sea. Charlie Dwyer, cofounder of Asia Pacific Superyachts and captain of a 42m sailing yacht, picks spots to chill out in the Gulf of Thailand. This pristine archipelago of 42 tiny limestone islands off Koh Samui was the inspiration behind the film The Beach and is one of the best movie locations to visit on a luxury yacht. Start by exploring the caves and hidden lagoons by kayak before climbing a series of steep ladders to reach the seawater lake on Mae Koh island. Here you can view the shifting colours of the sea. The islands of Nangyuan and Koh Tao are connected by a secluded white sand beach, a beautiful, serene spot for a barbecue or picnic, which can be organised by special permission, and for a fee, after 5pm. Asia Pacific Superyachts can arrange this for you. 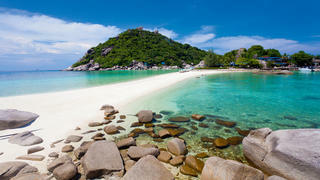 Shark Island is a twin rock outcrop to the southeast of Koh Tao. On the islet’s east side you can dive up to 25 metres. Here you’ll find soft corals, gorgonians and sponges, while the west offers hard coral formations home to moray eels and stingrays. 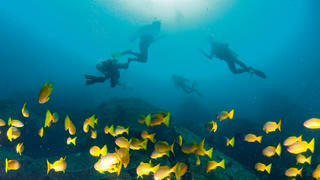 Or go on a deep dive at Hin Wong Pinnacle on the northeast side of the island. Experience the traditional Thai way of life at Salakphet, the oldest community on Koh Chang. The beach isn’t suitable for swimming but the yacht club can organise fishing trips for you. The Salakphet Seafood restaurant is also an unexpected treasure. 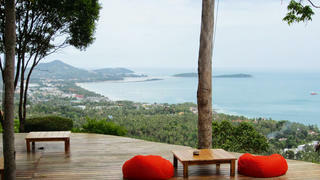 High in the mountains, in a coconut plantation above the bay of Chaweng, there’s a hideaway where Samui’s groovier residents come to chill out. You can enjoy a light meal or lay back with a cocktail, while Bob Marley plays over the sound system. The views are magnificent but the journey, via a steep road, is not for the faint-hearted. Inspired to visit? 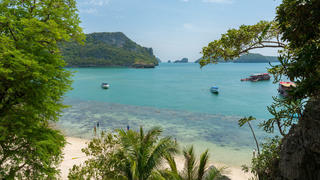 Don't miss our guide to 7 days discovering Thailand by superyacht. High in the mountains, in a coconut plantation above the bay of Chaweng, there’s a hideaway where Samui’s groovier residents come to chill out. You can enjoy a light meal or lay back with a cocktail, while Bob Marley plays over the sound system. The views are magnificent but the journey, via a steep road, is not for the faint-hearted. Inspired to visit? 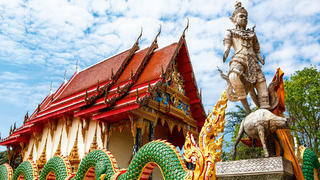 Don't miss our guide to 7 days discovering Thailand by superyacht.